Dawn is breaking over the towers of Shinjuku, replete with the promise of a brilliant azure-sky spring day. Weather not exactly reflecting the international storm that is likely to break out over the course of the morning. On Sunday, Deputy Prime Minister and Minister of Finance Taro Aso and Public Safety Commission Chairman Furuya Keiji paid their respects at Yasukuni Shrine. Minister for Internal Affairs and Telecommunications Shindo Yoshitaka paid a visit on Saturday (Link). Aso merely walked up to the offerings box, paid his respects and left, without entering the main building. Shindo and Furuya went inside and signed the register, with Furuya claiming he signed in as "Furuya Keiji, Minister of the Cabinet." Yesterday was the first day of the shrine's three day spring festival. Prime Minister Abe Shinzo has pledged to stay away in the flesh if not the spirit. However, do not be surprised if State Minister for Administrative Reforms　(and Bureacratic Reform and Cool Japan Promotion and Taking On Life's Challenges Again -- no I am not making those last two up) Inada Tomomi pays her respects either today or tomorrow -- today being the more likely choice given that the Cabinet meets on Tuesdays. Stepping back at bit from what has transpired and is likely to transpire over the next few hours, Yasukuni is a huge, symbolic non-issue in East Asian life, a lovely carbuncle upon the face of Japan, the legacy of the confused and confusing priorities and habits of the samurai of one particular han (藩). I just wish that there were Chinese and South Korean commentators who could tell their countrymen and women, "Look, most of this stuff that drives us to distraction? Most of the time it is not a Japan thing. Most of the time, it's a Satsuma thing." Minister Inada, who hails from Fukui Prefecture, who is her hero? Later - For those keeping score on the importance of dynasties and lineages in Asian politics, Minister Shindo is the grandson of Kuribayashi Tadamichi, commander of the defense of Iojima (a.k.a., Iwo Jima - Link - J). Like I said three weeks ago a masakaki is not a tree (see above). Furthermore, Abe's making an identical offering in 2007 did not "infuriate China" -- so saying that it is likely to do so this time around is no more than provocative pot stirring. Even later still - Martin Fackler of The New York Times checks in with his version of the story, with Prime Minister Abe offering yet another species of tree the masakaki is not and misidentifying Kato Katsunobu (and yes, I would love to say something about the hair, associating Kato with a certain Muppet) as a member of the Cabinet (Link). Kato is a Deputy Chief Cabinet Secretary, a position that will get your name listed on the Cabinet page of the Prime Minister's Residence (Link) but which nonetheless does not make you a cabinet member. To be fair about this mysterious pine business, Zojoji Temple in Minato Ward has "Grant's Pine" (Guranto matsu) in its main courtyard, which a former U.S. president Ulysses S. Grant planted there in 1879. All fine and wonderful except of course Grant's Pine is not a pine but a Himalayan Cedar (Cedrus deodara). 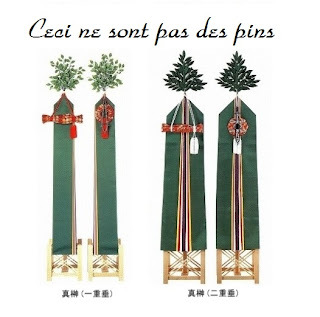 In the Rules for Ritual Procedure at Shrines (Jinja saishiki) implemented in 1875, the term masakaki is used to refer to two poles of Japanese cypress (hinoki), to the tips of which are attached branches of sakaki, and below which are attached five-color silks (blue, yellow, red, white, and purple). 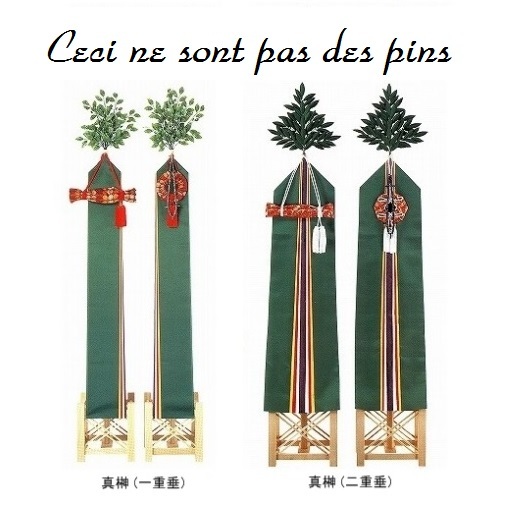 The pole on the right (when facing the shrine) is decorated with a mirror and a jewel, and the one on the left with a sword. Thank you for the research in support of my exasperation. Could you explain what a "Satsuma thing" is for those of us who normally think of Satsuma as a sweet potato? I was showing an out-of-towner around the sights of Tokyo last week and we found ourselves wandering under the torii and past the martial statue that sits amid the asphalt runway to the shrine buildings and I was struck by the thoughts: What a terrible, fascististic place Yasukuni is with its rampant supersizing of everything - is this the inevitable result of the state usurping religion? What a contrast to the rather sweet local shrines of Abiko. It was with great relief we made it down the Yasukuni Dori to the delightfully disorganised second-hand bookshops and a glasses shop that still displays a black and white photo of John Lennon in his NHS specs that was there 15 years ago. Er, anyway. In future, I shan't be visiting the shrine in a personal or public capacity. Thanks for the question. I will try to whip up something up for Foreign Policy or a similar publisher outlining what I mean. I do not mind the shrine. I might not even mind the Yushukan. What bugs me are the loungers dressed up (or down, I cannot tell) in Imperial Forces costumes.